A friend of a friend told me it’s like diving into a swimming pool in the dark. You really don’t know what you’re getting into. That’s the experience of moving abroad. I’m about to learn what that sensation feels like for myself in just 8 days. That’s when I catch a flight with my husband to South Korea. It’s a move that we chose – and yet the knowledge that the change is around the corner is surreal. We’re changing cultures, languages, and certainly locations… not to mention our careers. For eight years I’ve worked as a television news reporter, but now I’ll have a different audience. It’s a much younger demographic – grade school students -- and I’m responsible for helping them learn English. The truth is, I’ve always loved school, and now I’ll be able to discover what it’s like to have my own class! These last days in America are filled with precious moments spent with family and friends. Leaving them will be difficult, one of the toughest things I’ve ever had to do. The mind plays tricks on you – when you’re farther away the missing feels more acute. So, we’ve spent these last weeks crisscrossing the country saying goodbye – Colorado, Ohio, Indiana, New Jersey, Pennsylvania, back to Jersey and then Indiana one more time. All I have to say is…thank goodness for Skype. So, the mixed emotions rage on – exhilaration coupled with anxiety and hope. Mostly hope – hope that the next year exceeds our expectations. Along the way, I plan to chronicle all the bumps, faux pas, learning experiences, and laughter. 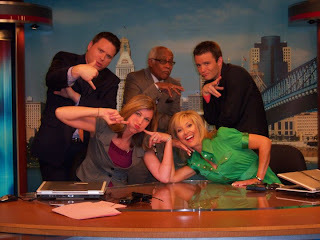 One of my final days at Local 12...where we were always professional! My two precious nieces -- they are already missed. Saying goodbye to cherished friends was hard to do. Thank goodness we live in an age where staying connected is possible.